When it comes to choosing the best farm fence for your farm, ranch or land, there are many factors that can influence your final decision. You will need to take into consideration the fence location, the proposed use and your available budget along with the style of farm fencing you prefer. While choosing the best farm fencing is one of the most important investments a land owner will make, the two top priorities in your decision making process, above all others, should be safety and durability. Other factors to consider include containment, maintenance and aesthetics. farm fences the sturdiest and safest of all polymer fences available on the market. Derby Fence is manufactured from High Density Polyethylene (HDPE farm fence) and will not become brittle even at 60 degrees below zero and will absorb the impact of a full extended leg kick from any breed of Equine or Bovine. Generally, land owners want the most durable farm fence they can afford. Derby Fences are strong, durable, aesthetically beautiful, easy to clean, stain resistant and virtually maintenance free for years. The rails and posts are manufactured out of high-density polyethylene (HDPE) materials that will not shatter or split in extremely cold weather. Derby Fencing withstands temperatures as low as -60 degrees Fahrenheit, contains no arsenic or chlorides and will not contaminate water or soil. HDPE is also impermeable to acids found in animal wastes. Fencing is an extremely important safety consideration for your farm, ranch or land. Ultimately, your budget is going to determine the type of farm fencing you choose for your project. 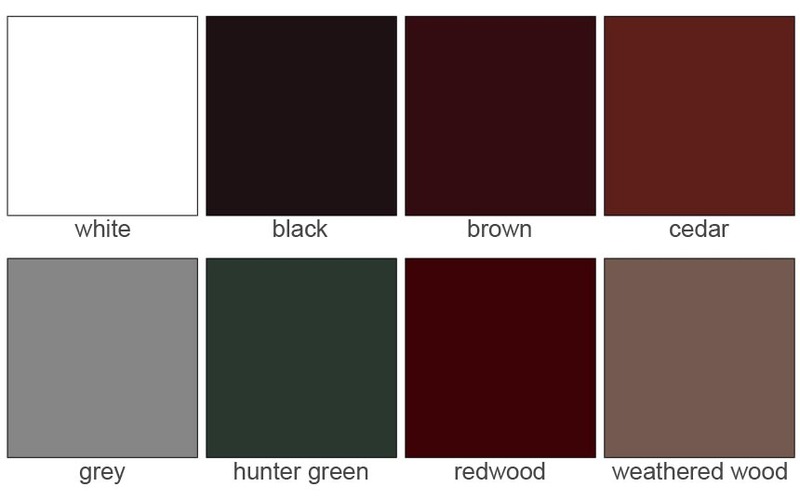 The style and type of fence that you need will depend on several factors. A High Density Polyethylene (HDPE) Derby Fence is the right choice if you are looking for a safe, durable, and virtually maintenance free farm fence product that is the ultimate fencing solution for any location or climate. All Derby Fencing is 100% American made by Lakeland Plastics in its Mundelein, Illinois facility utilizing state of the art extrusion calibrating equipment and CNC machining centers. Derby Fencing reclaims 100% of its scrap production, thereby contributing nothing to the areas landfills, and recycles all its cooling water striving to be as Eco friendly as possible. Your animals will be safe inside Derby’s HDPE farm fence products and you will be choosing an environmentally friendly fencing option. Farm fencing is a major investment that requires exhaustive research and diligent planning before you make your final decision. If you have questions about your location, type of fence, material choice or cost, please contact us. We are uniquely qualified to answer any questions you may have about farm fencing. Ultimately, you will choose a farm fence that meets your budgetary requirements and personal preferences, but please always keep safety and durability as top priorities. Define your space with our Two Rail HDPE Farm Fence or Ranch Fencing. It blends beautifully with any architectural style and is a great way to add a touch of elegance as a perimeter fence. 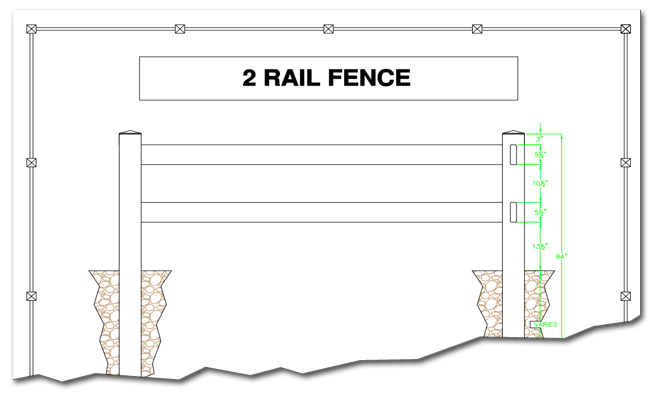 A two rail HDPE farm fence is suitable for pastures, arenas or to enhance the looks of an entryway, with enough visibility to deter livestock from crossing and appearing suddenly in front of a vehicle. There are many environmental problems associated with PVC fencing. PVC can also be difficult to recycle. The HDPE that Derby Fence uses is inherently safe to the environment. Because Derby Fence uses nothing but UV stable HDPE, a Derby Fence can easily be recycled at the end of its’ useful life. Our fencing is safe for containing all types of animals and pets. Derby Fence will not splinter or cause injuries. Derby Fence is one of the toughest plastic farm fencing solutions on the market. The posts and rails have twice the wall thickness of most PVC fencing. Our posts weigh approximately twice that of a standard PVC Post. Derby Fence is made to withstand years of abuse from the elements and your animals.